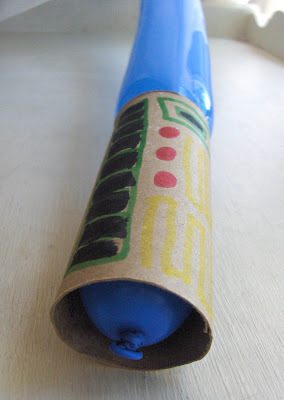 This had to be my favorite activity at the party, make your own lightsaber. All the boys had fun making and customizing their own lightsabers. It was fun to see what each child made. Some went with traditional handles while others decorated theirs with lots of colors and stickers. My son came up with the idea of making a dual lightsaber (picture above). I thought this was very clever. I think he's inherited my craftyness, what do you think? 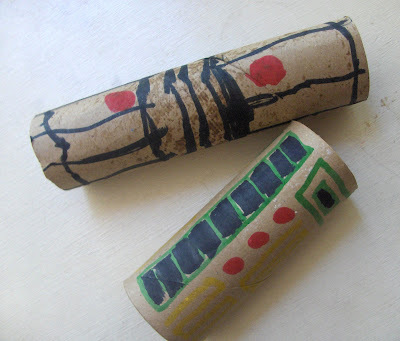 Have children decorate toilet paper rolls with markers and stickers. While the kids are doing this, I recommend blowing up the balloons. Leave about an inch of the balloon unfilled. This will prevent the balloons from popping while the kids are playing with them. 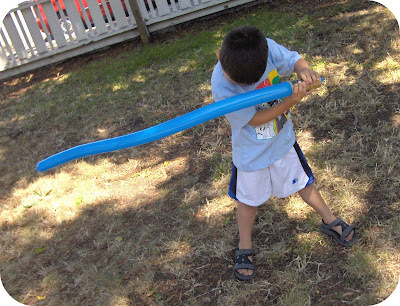 Stuff the balloon into the lightsaber handle. 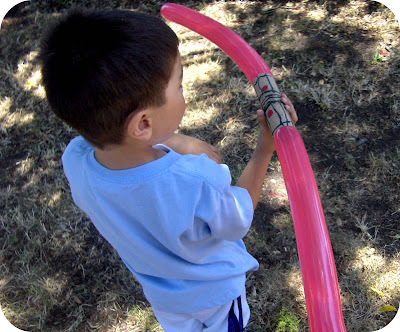 Depending on the size of the balloon you may want to add a little glue inside the handle. For these ones I didn't need glue at all. Done. It's inevitable that a balloon or two will pop so I recommend making a few extra. *Have children duel with their lightsabers standing on one leg. The child that can last the longest on one leg wins. *Make an obstacle course out of whatever you have at your house. We used soccer cones and training ladders (the kind that lay flat on the ground). You could use chairs in replace of cones, get creative. Have children run through the course with the lightsaber in one hand. You could time them for more of a challenge. *Pop bubbles with lightsabers. I recommend using a bubble machine if possible. This would be a good game for toddlers. I'm a long time lurker, but I just had to comment on your fantastic Star Wars party. Everything looked so fun and just perfect. Love it, love your blog. OH MY GOODNESS! My husband is getting these at his next b-day party whether he wants it or not! so cute! ooooooooooooh what a GREAT idea!! My hubby turns 27 in December... hehe I think he'd get a kick out of this!! He is a Star Wars "geek". I say "geek" because I mean it 100% lovingly!! with a little nephew and his geek father, this idea is always neat when they start bragging me. Thank you!! haha... that is a cool one. Great fun! WOW-that is SO creative, I love this! The handles are fabulous. I'll be linking. awesome! can't wait to add this to our party! thanks! This is so fun! I'll have to bookmark it to use with my kindergarten class next year - a perfect addition to the letter "L"! my 6 year son just happened to be lurking behind me when I was reading the post - & immediatley wanted to make one - even tho' we own far too many light sabers than anyone house should! great idea! 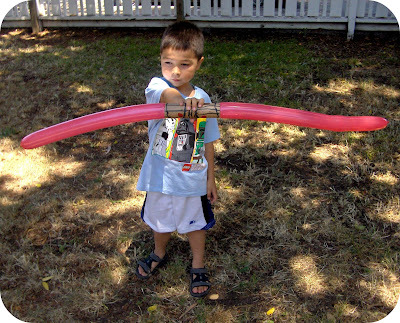 The double-ended red lightsaber is Darth Maul's lightsaber from Episode I! Too cool...my kids are gonna LOVE IT! This is a great idea! I stumbled this one:-) Thanks! We did this today at my 5 year old's party- we did the bubble machine thing too, and they went wild! THanks so much for the idea. It was so much fun. Awesome Idea! 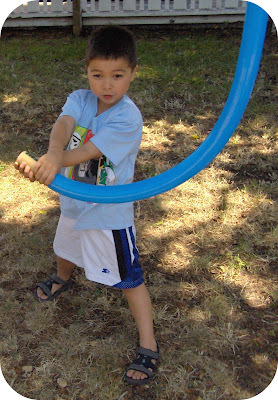 =) My 3 year old son has been asking for a lightsaber toy for months.... This is a safe, fun way to give him what he wants. Great job! I love this idea! I am featuring it on somewhatsimple.com tomorrow (Monday). Thanks for the inspiration!